It's autumn 1945 and young Liz's dad is home after being away for a long time fighting in the war. In fact, he has been gone so long, that he has become a stranger to Liz, who is feeling shy and a little afraid of him. November is hunting season and father and daughter are going out to look for crows, because crows eat the crops. But first, there is a new rainbow plaid hunting shirt to be bought for Liz, so big it hangs to her knees. On the big day, Liz and her dad get up very early, drive to the diner for breakfast, and then off to find crow and to maybe become reacquainted with each other. Liz's job is to blow on the crow call whistle just the right way to wake the crows up, her dad's job is to kill the crows with his hunting gun. As they walk to a good hunting spot, Liz asks her dad if he was ever afraid in the war. he says, yes, he was scared, scared of lots of things, "Of being alone. Of being hurt. Of hurting someone else." When Liz admits to also being scared sometimes, he asks if she is scared now. "I start to say no. Then I remember the word that scares me. Hunter." When they stop and Liz blows her crow call, crows from all over come flying over, and the more she blows it, the more crows come. But no shot is fired, instead her dad just watches her delight in what she is doing. With one more blow, father and daughter head back to their car hand in hand. 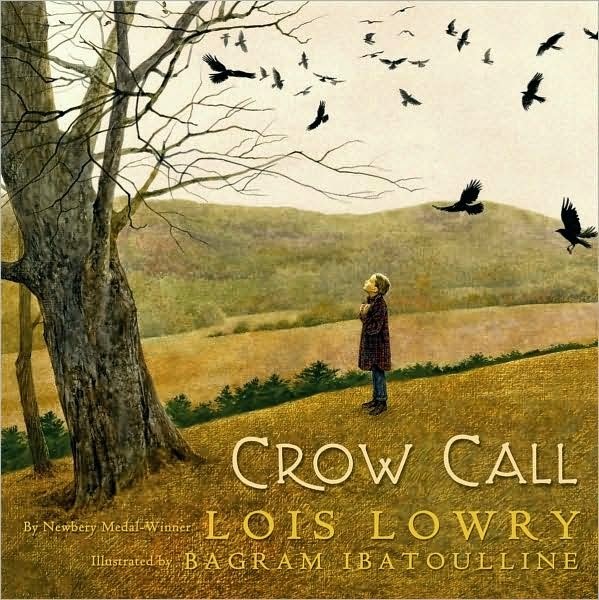 Crow Call is Lois Lowry's first ever picture book (surprising for such a prolific writer). It is a fictionalized autobiographically based story, taken from a day she actually did spend with her father after he returned from the war. Lowry addresses many issues in Crow Call, but I think the most important is Liz's fear of her father, a stranger has been away fighting and presumably killing other human beings, which is why I think their conversation about being afraid is so important. Liz needs to see her father as a loving, caring person again, not as a hunter. It is such a gentle story of how a father and daughter must find and learn to trust each other again after a long separation and while it takes place in 1945, it is a story that will resonate with so many of today's children who parents are or have been deployed overseas for long periods of time. The gently muted realistic illustrations done by Russian-born artist Bagram Ibatoulline are done in watercolor and aryl-gouache using a palette of earth tones, which perfectly match the mood set in the text, reflecting the end of autumn, and, metaphorically the war, but highlighting Liz's rainbow colored shirt. Fans of Lois Lowry will certainly appreciate this lovely picture book for older readers. And Crow Call would pair very nicely with Suzanne Collin's picture book Year of the Jungle: Memories from the Home Front. I have not read the book yet, but anything by Lois Lowry is worth finding. That you for letting me know about this one. You are so welcome. I was surprised when I first heard of this, too, but it is a really lovely father/daughter story. I have seen this one before, but never read it. I will have to pick it up! I have read many other books by Lowry and I am most curious about a picture book by her. :) Thanks for sharing!